The acting is fine and the Chipmunks are cute but the script is poorly developed and there are very few actual laughs. Jason Lee stars as Dave, a songwriter who can't get a break, despite the fact that his friend, Ian (David Cross) is a big cheese at Jet Records. However, Dave's life changes when he lets three adorable chipmunks (mischievous Alvin, brainy Simon and dozy Theodore, voiced by Justin Long, Matthew Gray Gubler and Jesse McCartney) into his home and discovers that they can sing. Naturally, when Dave shows the Chipmunks to Ian, they turn out to have the funky new sound that he's been waiting for and he immediately turns them into a global pop phenomenon. However, Dave becomes concerned that Ian is exploiting the Chipmunks, so he tries to win them back. Jason Lee is an extremely likeable actor and he makes a fine comic foil for the Chipmunks, even if his facial expressions are stretched to breaking point. David Cross is equally good, although Cameron Richardson (as Dave's hot neighbour) makes so little impact that they might as well have ditched the romantic subplot and let us all go home ten minutes earlier. The Chipmunks themselves are superbly animated and they blend in seamlessly with the real life actors. However, the voice effects backfire because they all sound the same and it's occasionally impossible to work out what they're saying. 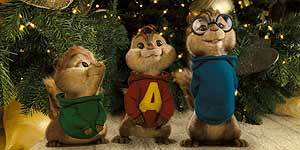 The Chipmunks started life in 1958 as a novelty singing group before being turned into cartoon characters, complete with merchandising deals. Unfortunately, the new film's attempts to make them hip are painful to watch and the product placement eventually reaches the point where they should have subtitled the film Buy Chipmunk Stuff. However, the film's biggest problem is that it simply isn't funny and the two obligatory gross-out gags leave a nasty taste in the mouth, literally. Alvin and the Chipmunks remains watchable thanks to Jason Lee and the cuteness of the Chipmunks, but be prepared to be badgered into buying Chipmunks stuff if you take the kids.